You are currently browsing the tag archive for the ‘mira grant’ tag. What the hell Emmet?! Zombies? Again!? Well..Set the way-back machine for June 21 2010. That was when I began the – now happily concluded (which you’ll have noted due to the lack of blog updates lately) – experiment to read and review a book each day. 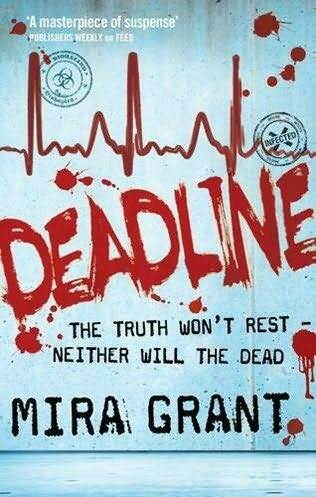 The first title was Feed by Mira Grant, the pen-name of Seanan McGuire who gave my humble notice a mention. I even got to write up a piece for Filmink Magazine based on Feed for their They Should Make A Movie of That feature. I am very fond of the book. Thankfully the sequel is pretty tops too. Shaun Mason survived the events of the previous book physically, but mentally he is the walking wounded. The death of his sister George has left him so severely disturbed he finds himself conversing with her ‘ghost’. She was always the better half of the two siblings, the voice of reason, the sensible one. Shaun has gone from the fun-loving thrill-seeking to a man with a death-wish. His blogger colleagues have begun to give him a wide berth, his mutterings and explosions of temper making him a liability in their attempts to give unbiased lived coverage of zombie-afflicted regions in America. But then a woman believed to have died in an accident shows up on his doorstep, describing a conspiracy involving the Centre for Disease Control – one that may be responsible for the death of George. Suddenly Shaun is a man on a mission again. Grant ratchets up the tension with the sequel and gives even more insight into the ‘managed’ zombie apocalypse of the Feed universe. The world-building continues, with this series a fascinating commentary on how social media relates to the mainstream and the compromised relationship between politics and big business. It’s a fantastic irony that the rise of the undead has catapulted the health industry into the biggest business within the world. It’s very amusing to see the CDC become targeted in so many zombie dystopias. The Walking Dead also featured the Centre in their first season finale and they themselves have taken advantage of this sudden popularity and produced a zombie comic of their own! There’s also some wicked humour on display here. Such as George and Shaun’s childhood viewing of Bambi when they cheered at the death of the titular deer’s mother, because she did not revive. Furthermore the ‘banter’ between the siblings produces a witty running commentary on the book’s action. This is an excellent horror series, with real brains and heart. So it appears someone went and invented a whole new horror sub-genre when I was not looking. Namely books about post 9/11 zombie terrorists. The first book I reviewed for this blog, Feed by Mira Grant did this very successfully I thought. Blood Oath by Christopher Farnsworth was less so, but thankfully did not take itself too seriously. Jonathan Maberry’s novel, as the title indicates, is once again concerned with the notion of scientifically plausible zombification. As silly as that sounds, to his credit the author makes a solid attempt at establishing plausible pseudo-science behind the plot. Which is kicked off thanks to that handy deus ex machina the United States Patriot Act. Joe Ledger is an ex-military serviceman who has worked with the Baltimore Police Department for enough time to realize that if he wants to put his investigative skills to any real use – and make better money – he should become a federal agent. He is well on track to achieving that goal when he is approached by a man known only as Church and recruited to become a member of a secret intelligence agency, the Department of Military Sciences. Their first mission, defeat a plot hatched by Muslim extremists to infect America with a pathogen that reanimates the dead. Joe’s recruitment is the result of a very special kind of interview. He survives being locked into a room with a zombie. Afterwards he finds himself heading a team of specially chosen grunts and intelligence agents to track down the source of the plague. Meanwhile in the Middle East (don’t you just love that phrase?) a man known as Sebastian Gault has been funding the activities of the terrorist El Mujahid. He will deliver the pathogen created with Gault’s money to the States, but who is manipulating whom? What is more, as the outbreaks of zombie attacks increase, it becomes clear to Joe that someone in the D.M.S., perhaps even a member of his own squad, is feeding information to the enemy. On the other hand, Maberry has done an admirable amount of research to justify his far-fetched plot. He also makes a number of nods to pop culture to indicate that this is meant to be above all fun. Characters mention 28 Days Later, Dawn of the Dead and The Evil Dead. Then there is ‘Doctor Hu’, whose name gets a startled reaction from Joe (who in turn appears to take his name from a Marvel superhero, as Hu points out). Enough character detail is given to flesh to the plot. As a modern man Joe prefers therapy to the confession box. His friend Rudy likes to debate the finer points of Blue State/Red State political divisions with him. What is more Maberry addresses that the activities of the D.M.S. are unconstitutional. Of course modern terrorism does not respect privacy laws, or the Geneva Convention, so in order to defend America they must fight fire with fire. Which leads to uncomfortable undertones of fascism. This is a macho fantasy and unashamedly so, but I fail to understand why 9/11, an actual historical event, is being employed to underscore fantastical horror (as already stated in my review of Farnsworth’s book). On that same note this book features a very ugly portrayal of Islam. A character dismisses the criticism that there is no way an Al Qaeda cell hiding in mountainous wilderness could successfully engineer a deadly pathogen in the required lab conditions, by stating that such an argument is racist. Regardless of that handwaving, it does introduce a note of implausibility into the plot. Also the villains of the piece are Muslims and decadent, bisexual Europeans. Finally, it is not scary. That is something of a deal breaker for me. Think Tom Clancy, but with zombies. The trouble with the news is simple: People, especially ones on the ends of the power spectrum, like it when you’re afraid. The people who have the power want you scared. They want you walking around paralysed by the notion that you could die at any moment. There’s always something to be afraid of. It used to be terrorists. Now it’s zombies. 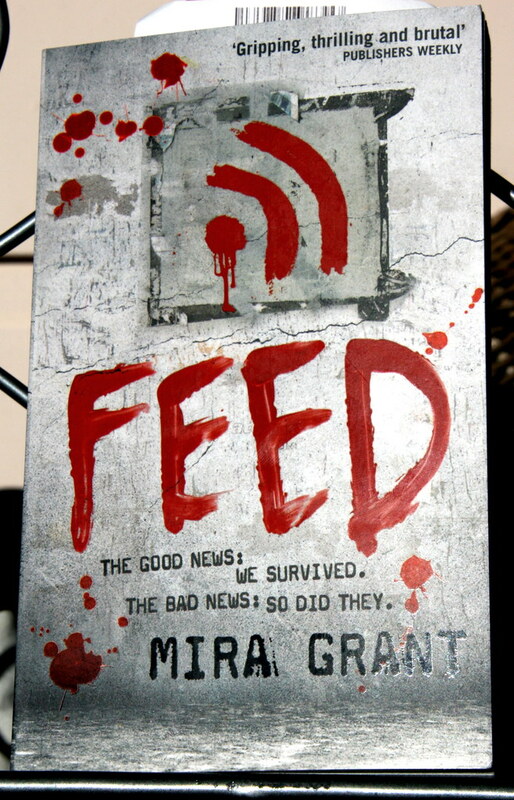 Feed by Mira Grant, is the first book in the proposed Newsflesh trilogy. A pet peeve of mine is debut authors releasing a title bearing the impending legacy on the dust jacket, ‘Book One of…’. But fortunately, on this occasion, Grant has created a world that I would happily return to. Feed is a self-contained political thriller that just so happens to feature zombies. It does not end on a cliffhanger, avoids clichés and is written with an unusual degree of passion when compared to most novels featuring the rancid undead, especially those predicting a sequel. In 2014 a hybrid disease known as Kellis-Amberlee, mutated from a combination of vaccines, one intended for curing cancer, the other the common cold, has spread across the globe. The result is that no one needs die from lung cancer or even suffer a case of the sniffles anymore. However, there is an unfortunate side effect – Kellis-Amberlee has also caused the dead to rise. Feed begins in a world transformed, but unlike in the movies the zombie apocalypse never arrived. Humanity has survived and society remains intact. It’s just that people just spend a lot more time indoors, blood tests are required to enter public buildings and the internet has replaced traditional news media as the primary information source due to the reliability of live-blogging in reporting zombie outbreaks. Which brings us to George (Georgette) and Shaun Mason. They are the new breed of blogger, traveling into zombie hot zones and filming what they see for the entertainment of their readers. There is even a shorthand to describe the different kinds of guerrilla journalists that have evolved in this zombified world. Take, for example the Irwins who are prone to risk taking; then there’s the Stewarts who are always ready with a pithy op-ed piece; the Newsies who report the facts, and the Fictionals who produce zombie fanfic, poetry and prose. It’s a very knowing take on contemporary media transplanted to Grant’s fictional world. George and Shaun are two of the more popular bloggers and are thrilled to discover they have been invited to cover the campaign of Senator Peter Ryman in the lead up to the 2040 Presidential Election. While Feed opens with the Mason siblings fleeing a pack of zombies in the wilds of Santa Cruz, the story soon veers away from the standard run-and-hide horror novel plot. Instead, Grant has Ryman’s campaign taking the Masons on the traditional town hall stump speech trail. The Senator answers questions on policy and George blogs her impressions of the man who would be president, until an assasination plot rudely interrupts the proceedings. This is Hunter S Thompson’s Fear and Loathing on the Campaign Trail ’72 reimagined by zombie film director George Romero. Feed is passionate and incisive writing. Grant is clever and thought-provoking, piggybacking on horror fiction tropes to speak to the audience about how we may be manipulated by the ‘news’, how fear motivates our decisions and how democracy is reduced to a special interest land-grab. At its core though, Feed is a story about a brother and sister who love each other very much. I eagerly await ‘Book Two….’ Deadline.